Doing away with victory points this mission instead focuses on infantry being killed. 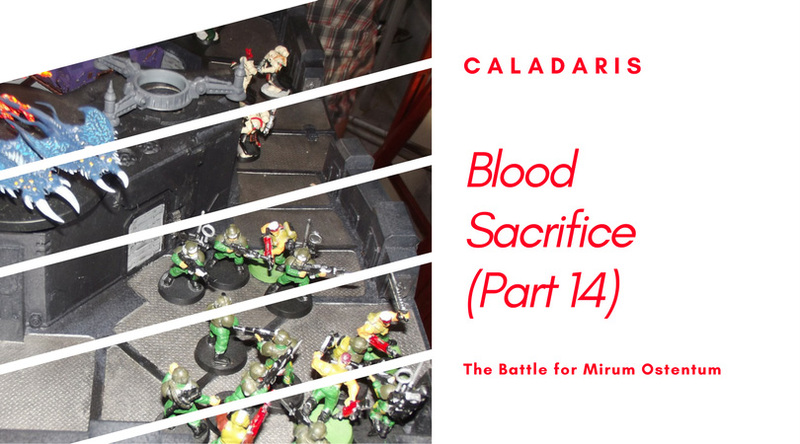 If 101 or more infantry models are killed during the mission and at least 70 cultists and conscripts are part of that number, then chaos wins and the blood ritual is completed. Any other result and the imperial forces win. The body count will include bikers and cavalry models that are killed but does not include any units that have the daemon special rule. Warlord Master Ganon, Terminator armour, power fist, combi melta. Campaign trait +500pts to bodyguard unit, Battle trait +3 to run and charge moves. Ravenwing black knights 3 with plasma talons. Ravenwing squadron 6 bikers, veteran sergeant with power sword and meltabombs, 2 meltaguns, attack bike with multi melta. 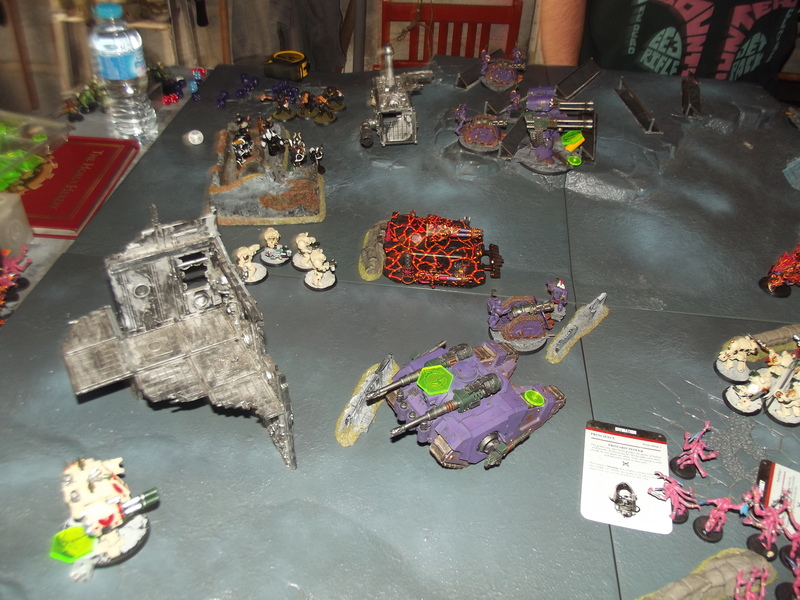 Devastator squad, 2 lascannons, 2 plasma cannons, sergeant with bolt pistol. Deathwing command squad, Apothecary, deathwing banner, deathwing champion, assault cannon, 1 standard terminator. Deathwing terminator squad, 4 with thunder hammer and storm shield, 1 with thunder hammer, storm shield and cyclone missile launcher. 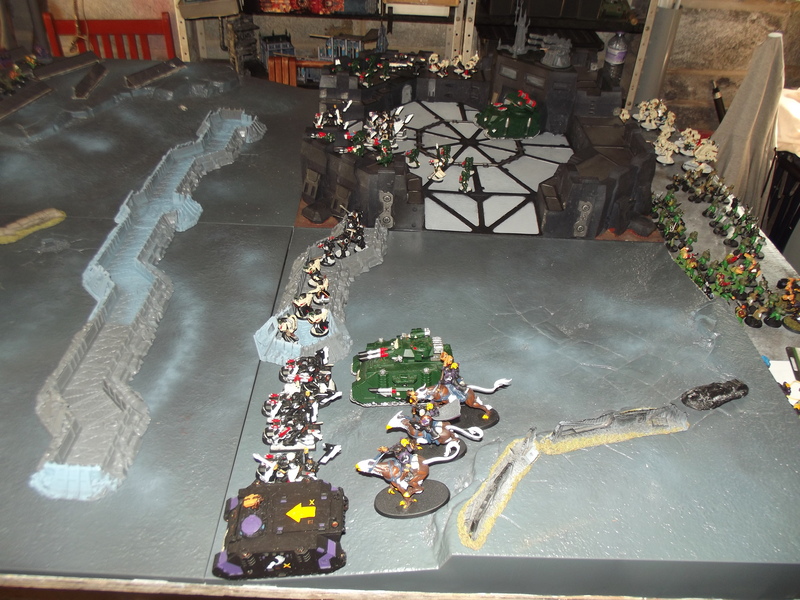 Deathwing terminator squad, plasma cannon, 2 chainfists, 1 power fist, sergeant with thunder hammer and storm shield. Tactical squad, heavy bolter, plasma gun, sergeant with power maul. Predator annihilator with lascannon sponsons. Librarian, level 1 with force stave. Deathwing terminator squad, 4 with lightning claws, 1 with lightning claws and cyclone missile launcher. Ravenwing land speeder, heavy bolter and assault cannon. Venerable dreadnought, twin linked lascannons, dreadnought close combat weapon with storm bolter. 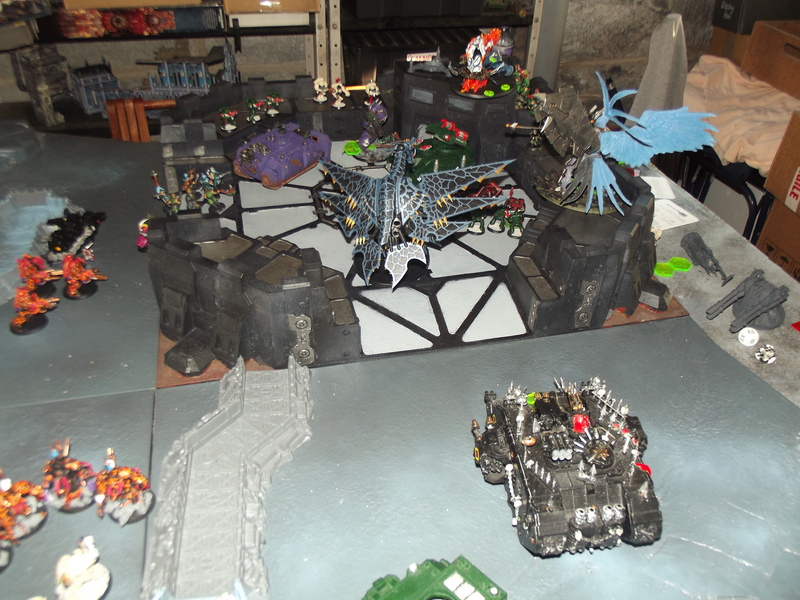 Castellum Stronghold with Icarus quad lascannon and command platform. 3 thunder gryph cavalry (1 with thunder hammer, 1 with thunder hammer and storm shield, 1 with frost claw and melta bombs. 5 wolf guard terminators with thunder hammers and storm shields. Grey hunters 7 bolters 1 plasma gun all have additional ccw. Kharne and khorne chaos space marine squad dropped from list. 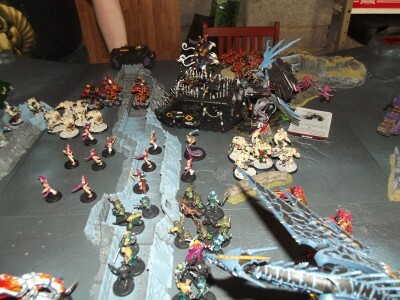 Added a herald of tzeentch with level 3 mastery, 10 dameonettes and a herald of slaanesh with the slothful claw. vindicator with power of the machine spirit. 10 man cultist squad, 14 man cultist squad, 16 man cultist squad, 10 man cultist squad. 8 man chaos space marine squad with 1 meltagun, aspiring champion with power fist and combi bolter. One member of the fallen is added to this unit. 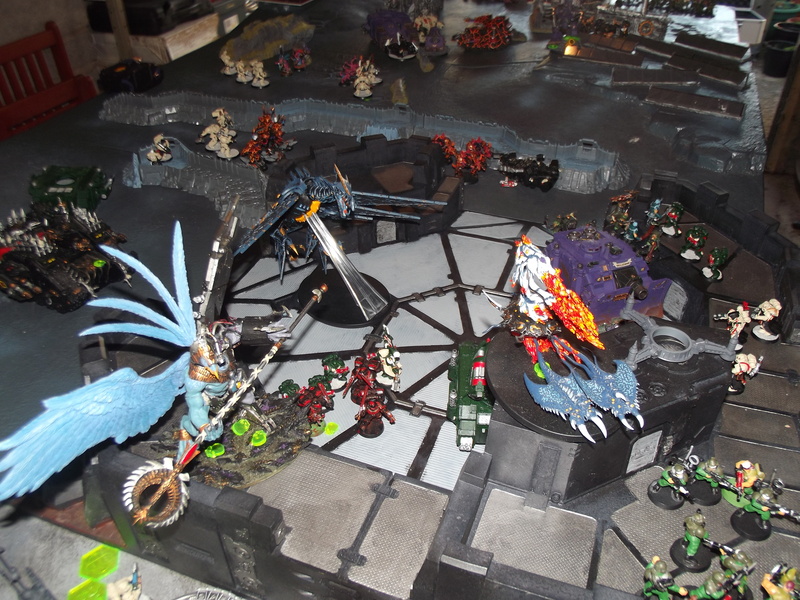 If the dark angels capture him then they may look at one of the apocalypse stratagems chosen by the forces of chaos. Outpost 379 – 3 hours later. The unnatural fog was begging to rise and surround the castellum stronghold that served as the last line of defence before the enemy could strike directly at Altum. This time the fog hid a further menace. A flash of red lightning struck the ground nearby a moment before the impacts became a torrent. This had cut them off completely, both visually and through vox communications with the city. Recruit Gerhard was selected to test the lightning wall as he approached he was struck once. This flayed his skin from his bones before sucking up all the blood from his dead corpse. He hadn’t even been able to scream. The remaining conscripts were pulled back into the area surrounding the main outpost. Each had seen what would now happen if they tried to flee. 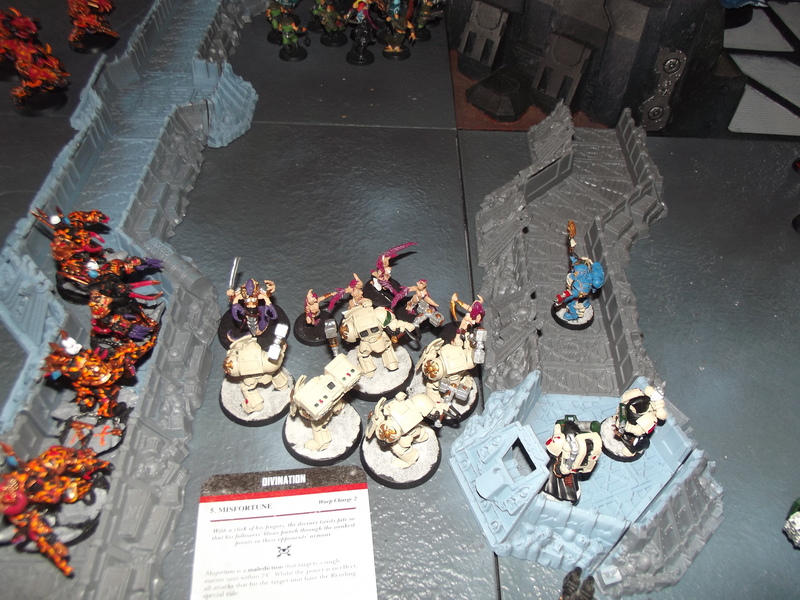 Morrs Penna and his forces made their way forwards through the blanket of the blood storm that had been summoned to this location and as they entered the eye of the storm the cultists they had brought with them were herded forwards. The storm would need to be sated so they could earn the gods blessing and gain a straight route of attack towards the city in the near distance. Librarian Regal of the Dark angel’s chapter had ushered all the conscripts into the castellum stronghold. The storm hawks that had been in the area where now under his command. The blood storm was churning up the warp in the surrounding area but they still had contact with Ganon. 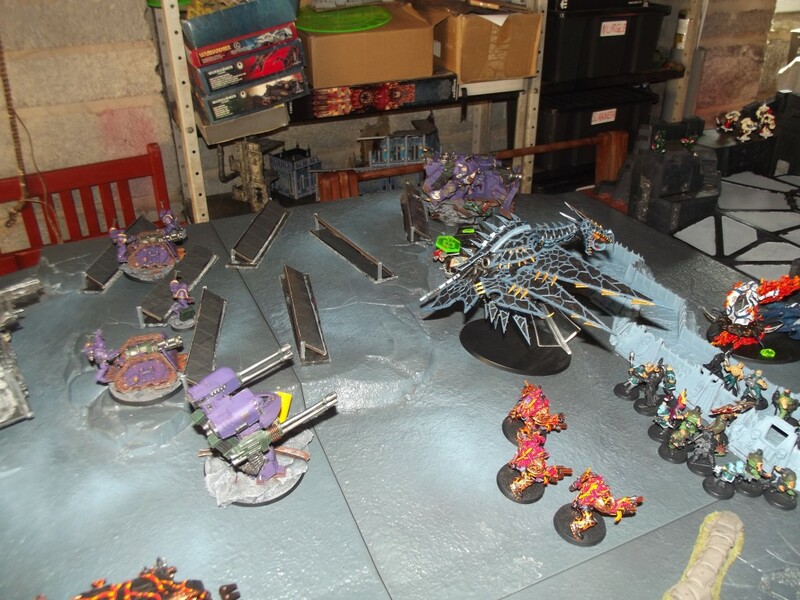 The Storm hawks had also arranged for an additional terminator squad to be teleported into the site from one of their ground based sites. The enemy force that greeted his sight as the fog lifted did not sit right with him. As the ravening lunatics at the front of the army were herded forwards he knew what the storm wanted. A sacrifice. 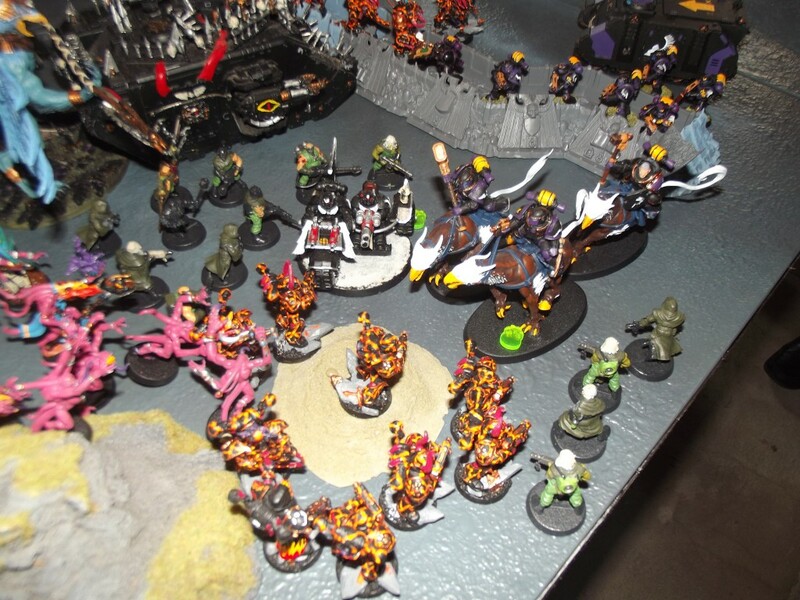 The forces of Chaos line up behind their cultist screen. 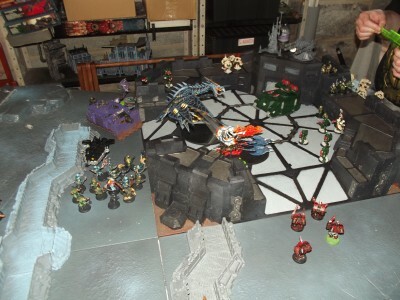 The member of the fallen who we have forced into this game is with the squad in the ruin at the back of the deployment zone. 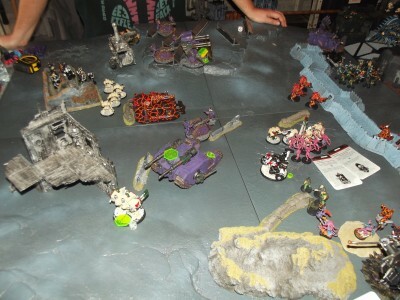 The forces of Chaos advance to get their heavier weapons into range. 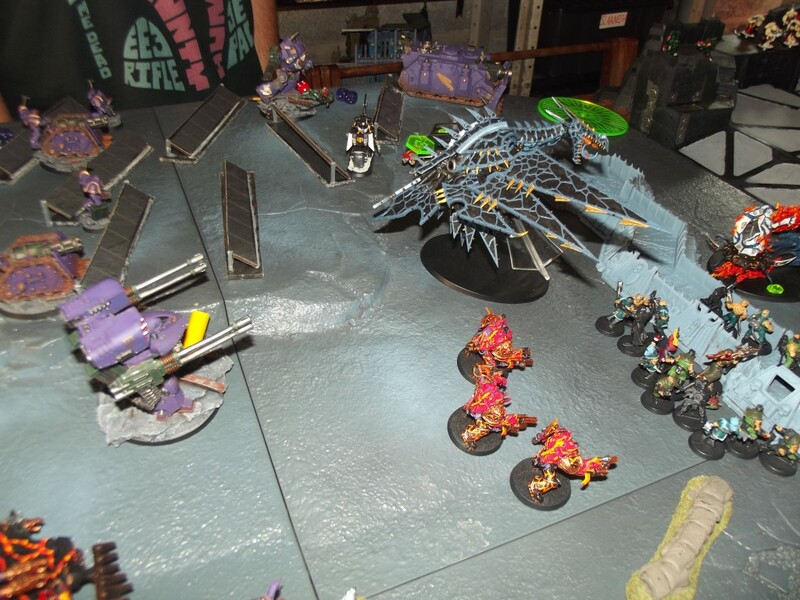 Psychic attacks and shooting claims the predator annihilator and five ravenwing bikers. The thunder gryph cavalry and ravenwing move forwards to close with the enemy. 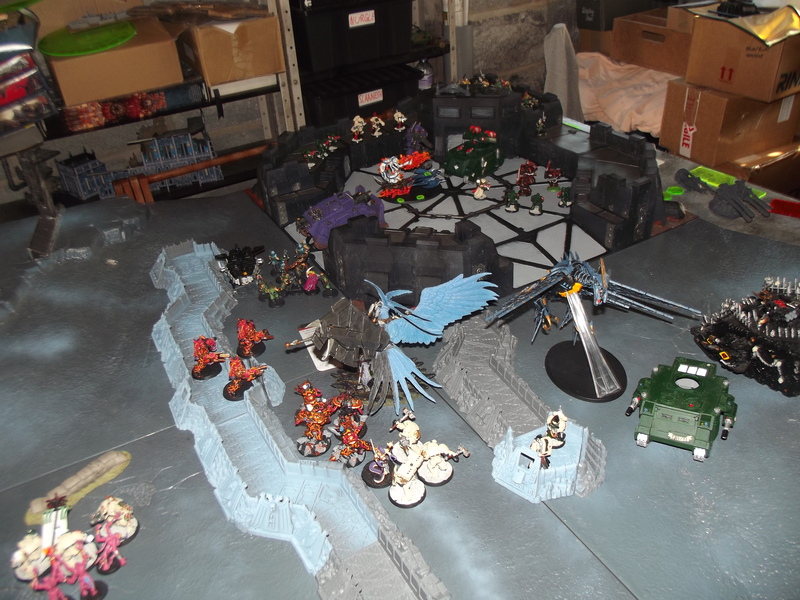 The storm hawks and dark angels librarian jump out of the rhino and make ready to target Morrs penna. The shooting from the biker and land speeder fail to hurt the burning chariot. The thousand sons rhino is immobilised while Morrs penna despite having a rerollable save loses four wounds. 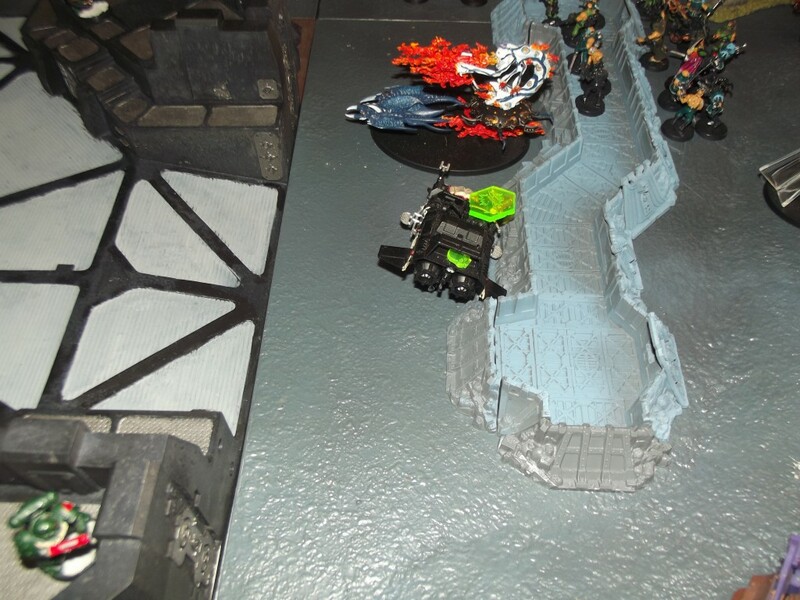 The one surviving ravenwing biker dies to overwatch from the burning chariot while the black knights kill off a squad of cultists. 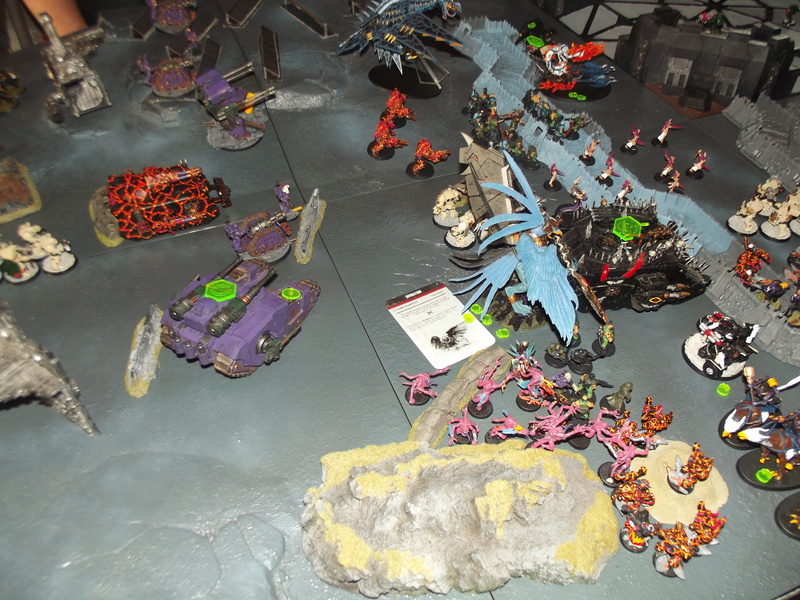 The attack bike and thunder gryph cavalry charge in and destroy the thousand sons rhino. 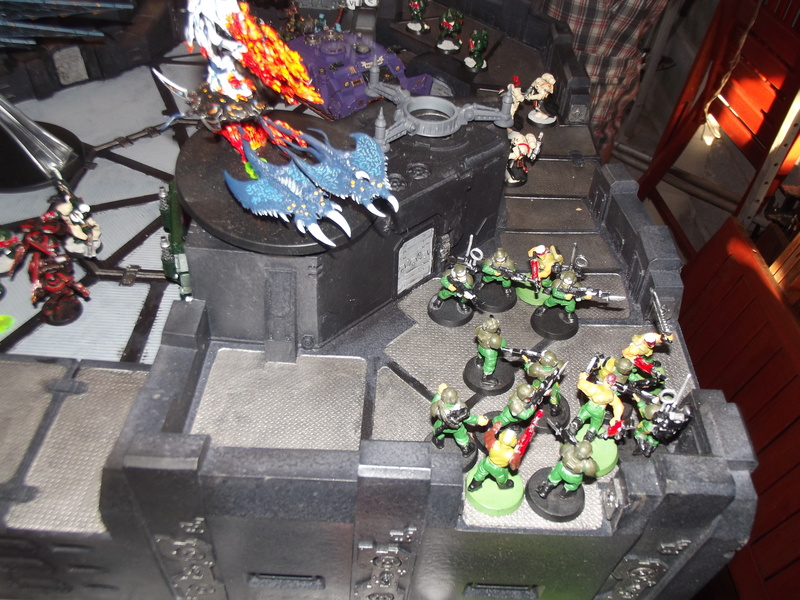 The khornate raptor squad deep strikes in and narrowly avoids going off the table. Four devastators and 5 tactical marines are gunned down. 2 ravenwing black knights also suffer the same fate. Despite a pile of shooting only one wound can be put onto the attack biker. The contemptor dreadnought easily wipes out the last black knight. 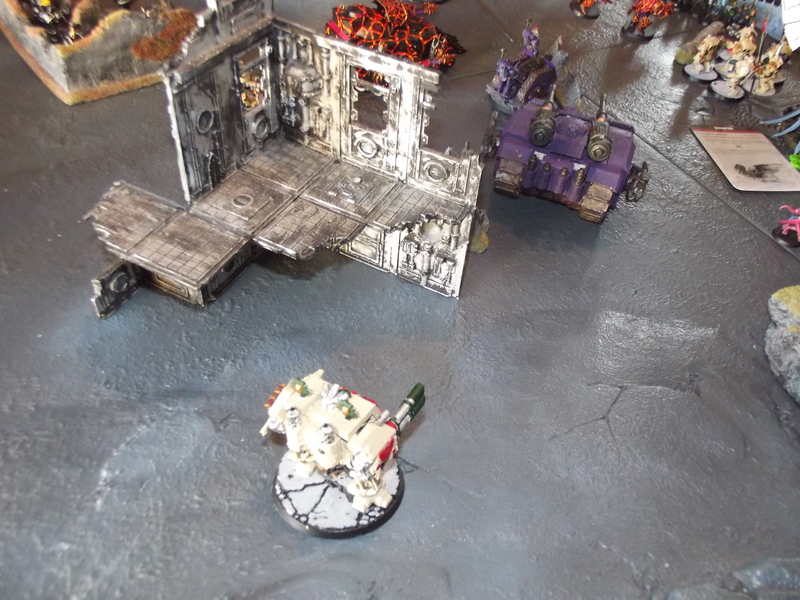 The assault cannon land speeder chases the burning chariot. 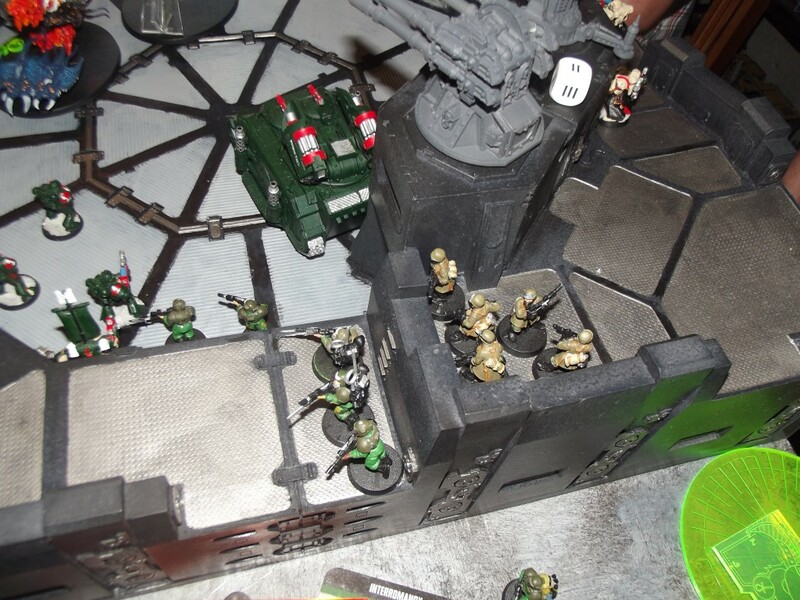 The dark angels assault squad moves to protect the stronghold. The chaos land raider suffers a crew shaken result while the sicaran is immobilized and the land speeder causes a wound to the burning chariot. 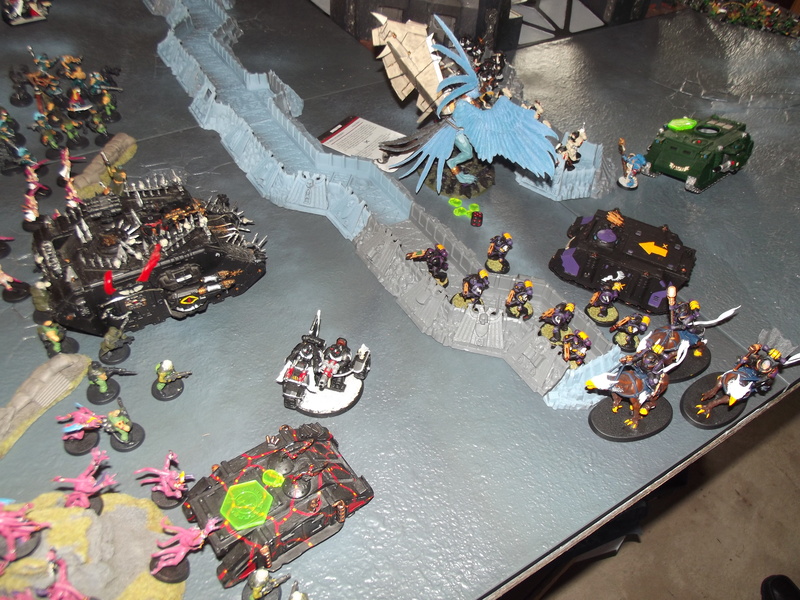 In the assault phase the chaos terminators kill off the storm hawk squad they are engaged with while the thunder gryph cavalry kill four thousand sons. 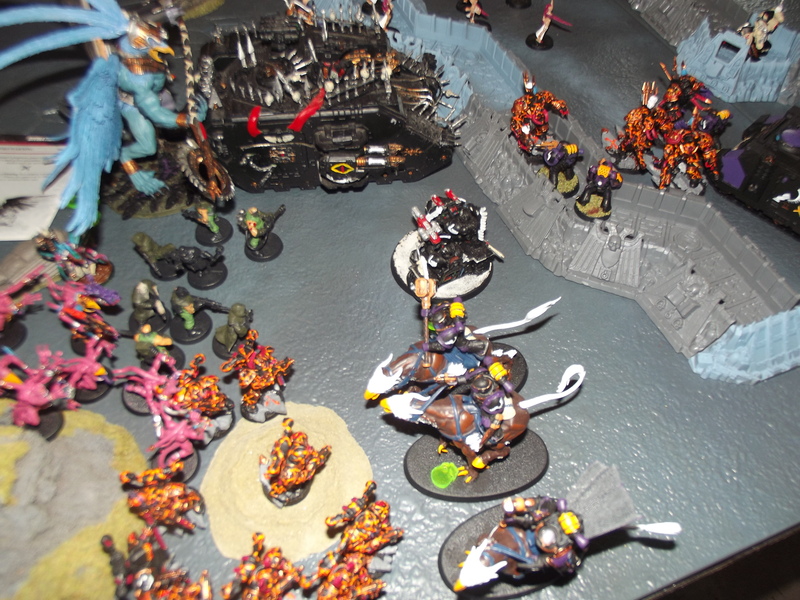 Morrs penna moves behind the thundergryph cavalry while the chaos land raider moves up. 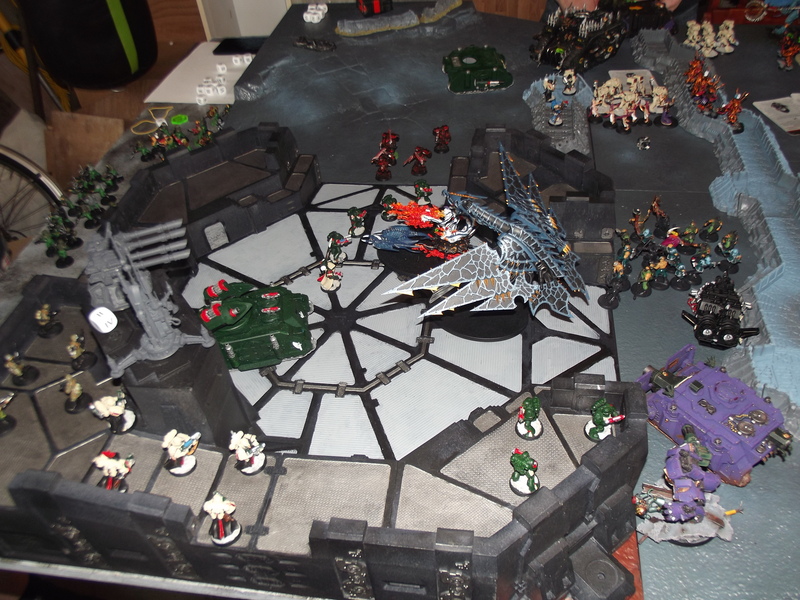 The burning chariot and heldrake move onto the stronghold tile. 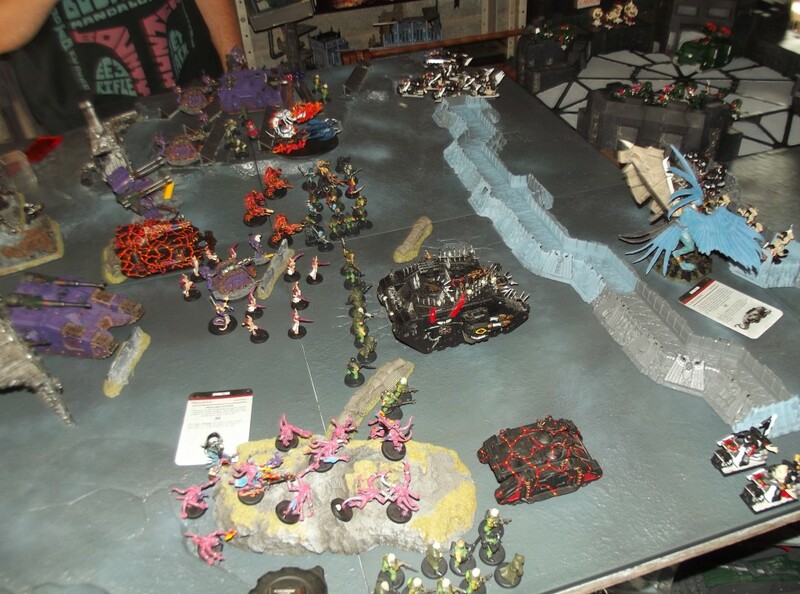 Iron arm and prescience is cast on the pink horrors who move to engage the deathwing command squad. This turn Cursed earth and precognition are denied but I still managed to give morrs a 3+ invulnerable save. I cast misfortune on the deathwing squad hoping to rend them with a heavy flamer. 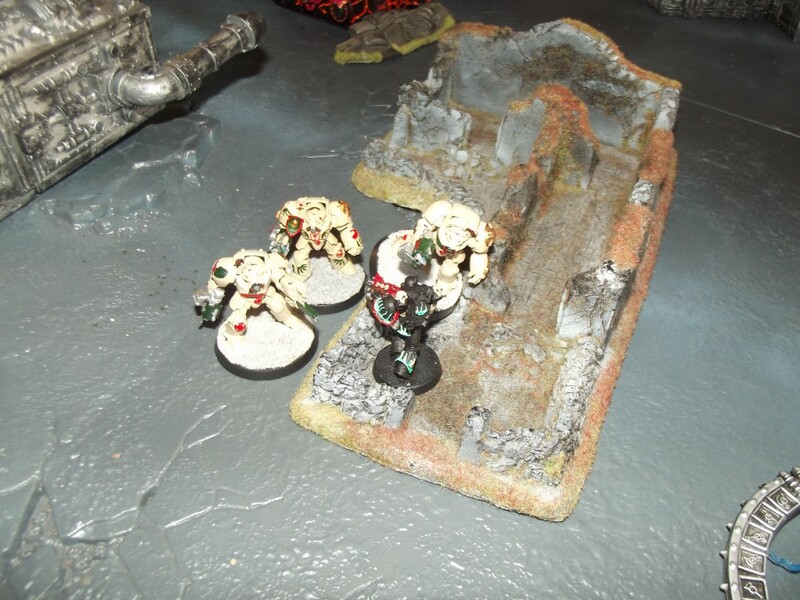 One deathwing terminator from the squad is killed by quad mortar fire while the dreadnought suffers two hull points of damage and is shaken by the sicaran. One of the storm hawk terminators is also brought low by chaos shooting. 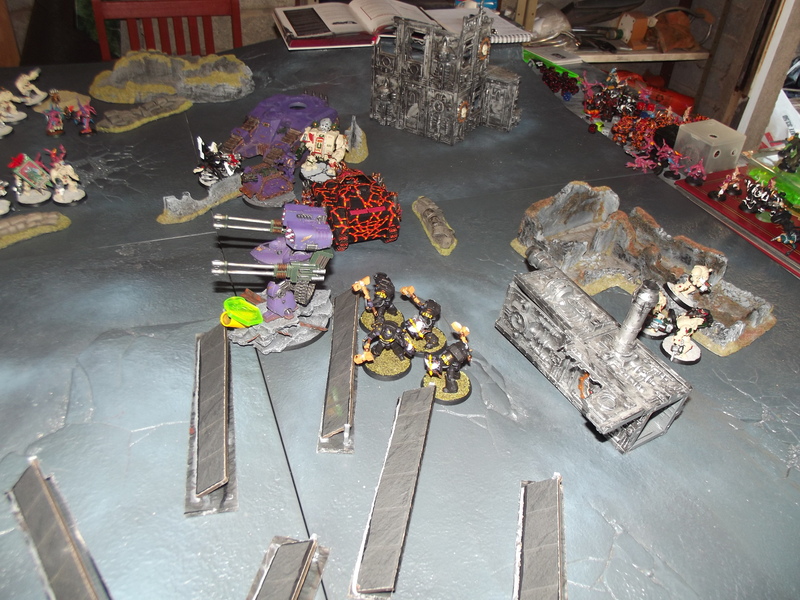 The pink horror’s kill two terminators and lose one in return. 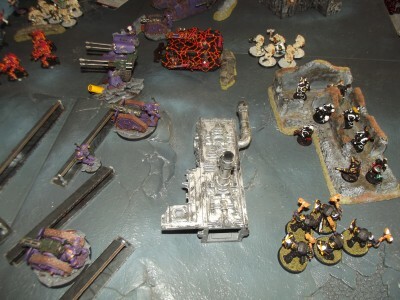 While the attack bike continues to survive being attacked by cultists. Morrs regains a wound from eating the thundergyph cavalry due to souleater. 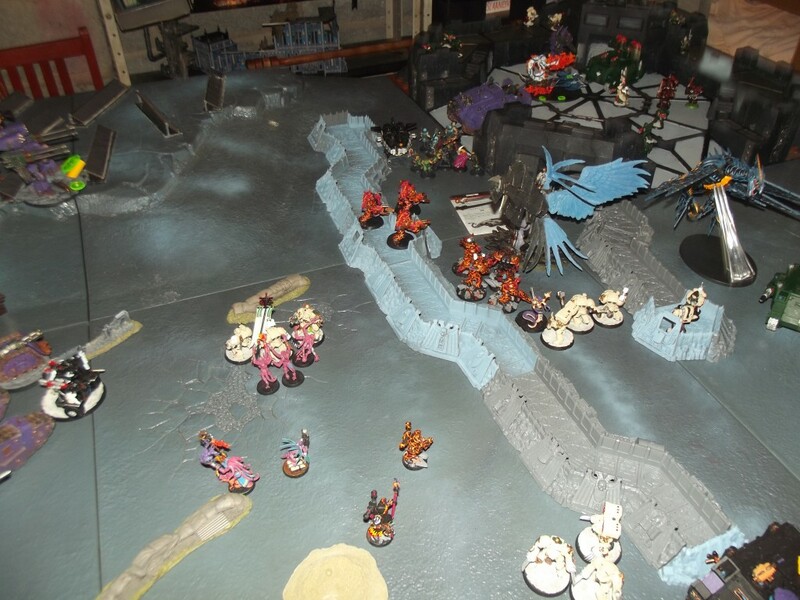 The daemonettes and herald charge in but cannot harm the deathwing squad. 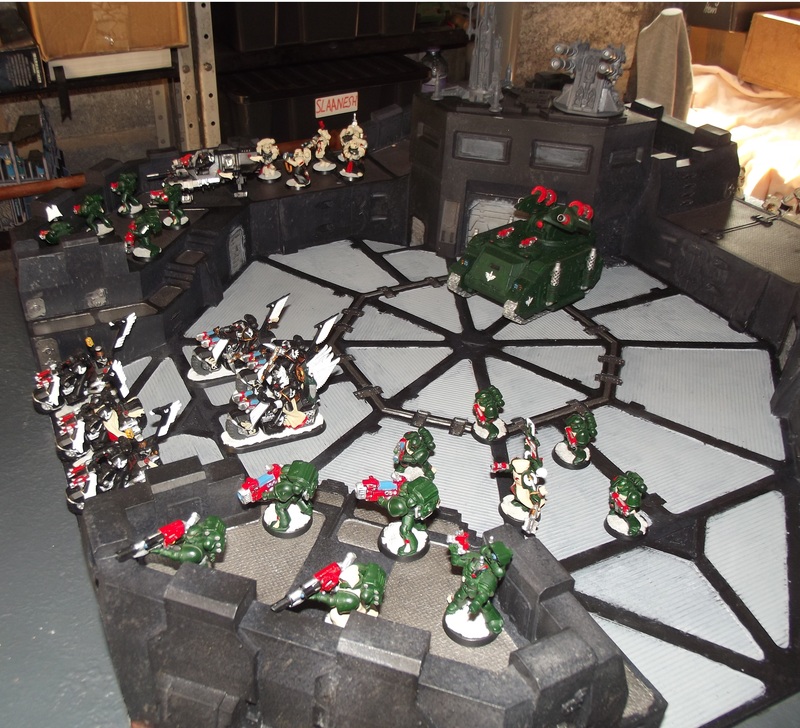 The khornate raptors have charged in and killed the dark angels assault squad. And the contemptor dreadnought wrecks the last small bunker in close combat. 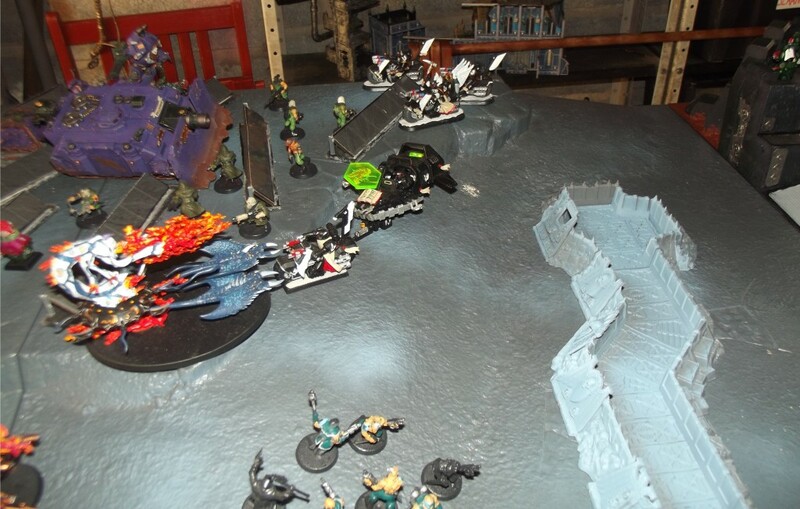 Seeing the threat the dark angels move to line up shots on the burning chariot. The ensuing assault sees the chaos marines being annihilated. 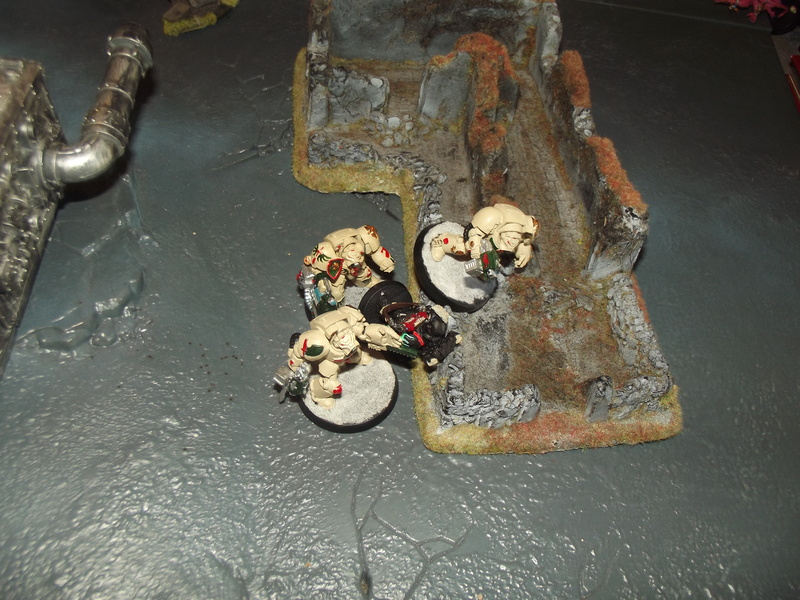 The remaining deathwing move to apprehend their target. 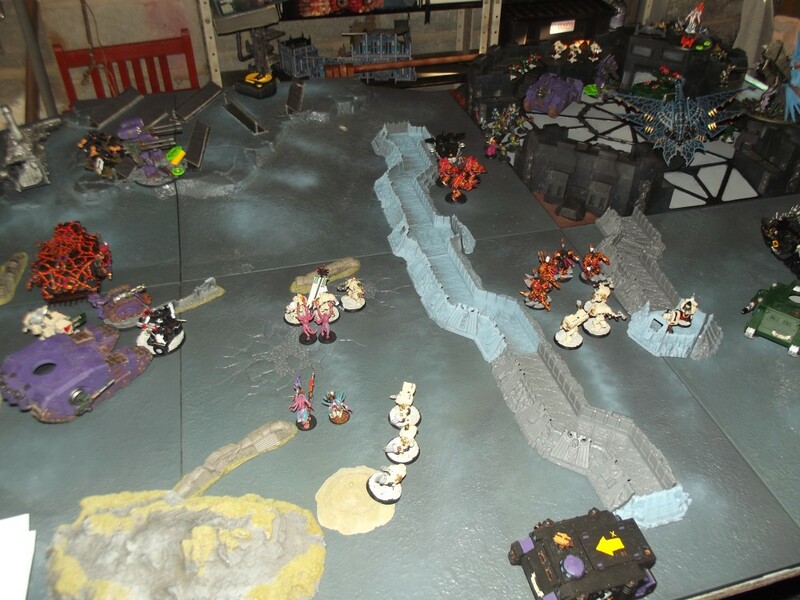 The dreadnought has destroyed the sicaran, the librarian dies in combat with the daemonettes, the attack biker killed a quad mortar batery crew member while the storm hawk terminators wiped out another. 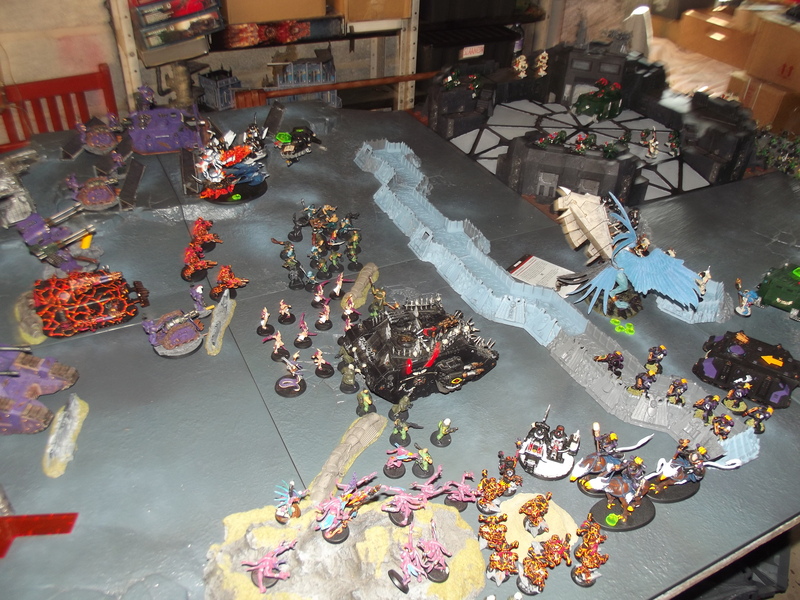 Morrs has moved towards the stronghold tile, the deathwing command squad have lost another member but have killed two pink horrors and psychic attack has killed two lighting claw terminators. The deathwing capture the fallen. 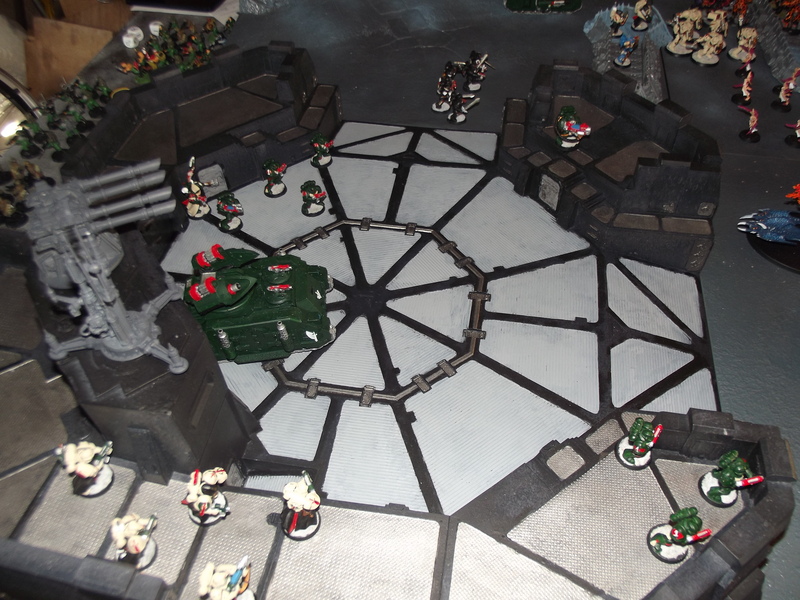 The dark angels on the stronghold tile move to shoot the contemptor in the back and delay the khornate raptors. The lightning claw terminators have killed the thousand sons, the storm hawk terminators smashed another canon while the raptors and tactical squad failed. The daemonettes have now bene wiped out. As we were running out of time we focused on the stronghold tile. Where Morrs, the heldrake, the vindicator and the burning chariot have congregated. The firing squad lines up. The conscripts get hit hard by the chaos shooting. The cultists charge into the dark angels tactical squad. The dark angel squad choose to not overwatch but still kill 2 cultists. Which tips the number of killed conscripts and cultists to 71. 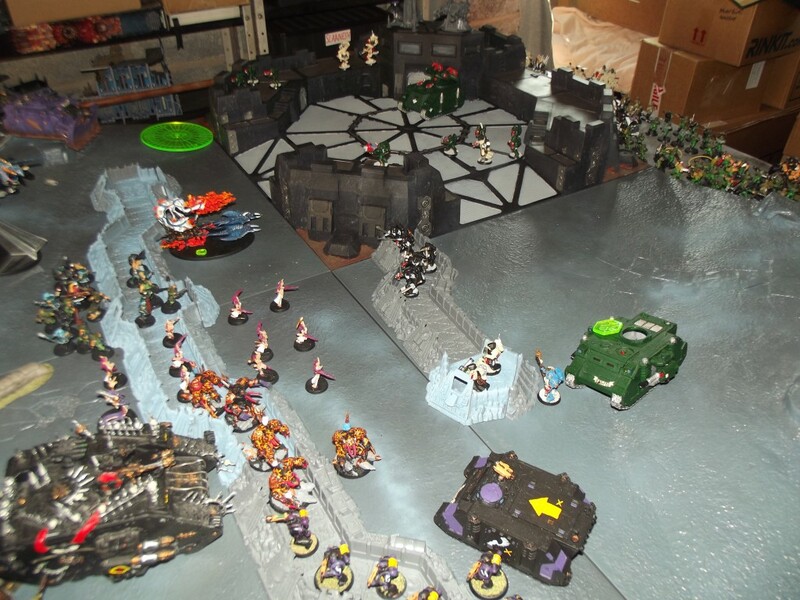 The final positions of the chaos backfield units and the imperial terminators. 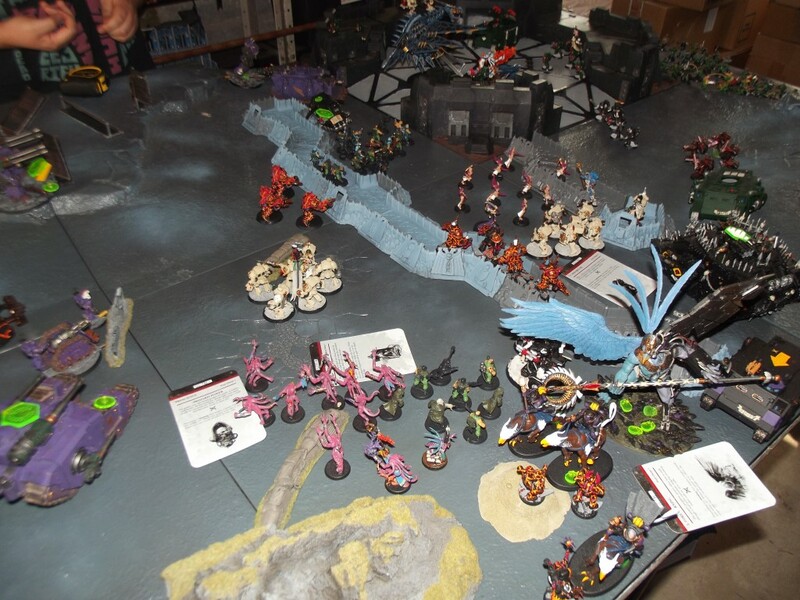 Given our time constraint and the outcome of chaos turn 5 we called the game here as even if we did play another turn the result had been determined. 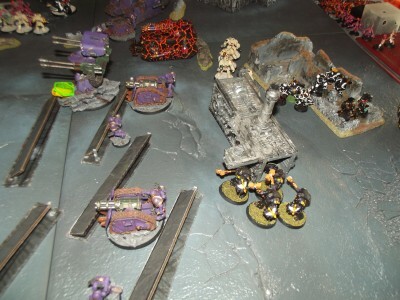 One of the bunkers of the stronghold crumbled under enemy fire and the collapsing structure crushed the devastators that had been shooting from the battlements. Further weapon impacts continued to strike at the remaining bunkers but the defences held for now. Regal had joined with the terminator squad currently engaged with the daemonettes, aiming to use his abilities to aid them in banishing the daemons. But before he could do anything to aid his brethren a claw slammed through his primary heart moments before a second impaled his secondary one. Librarian Regal crashed to the ground. The blood leaking from his wounds being drawn into the blood storm as his life left him. Furious at this the terminator squad fought harder to avenge him, while being forced to rely on their storm shields for defence against the lightning fast daemons who managed to down a terminator before they were banished. 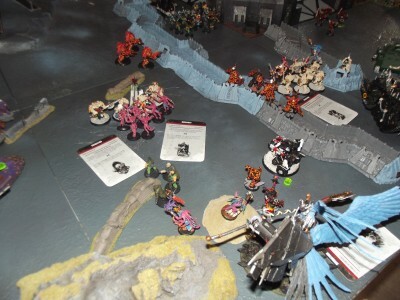 The blood storm intensified and threw most of the forces in the area into a stupor as it slowed their actions to a crawl. All eyes that could do so focused on the stronghold as the final bunkers failed and the conscripts within piled out. 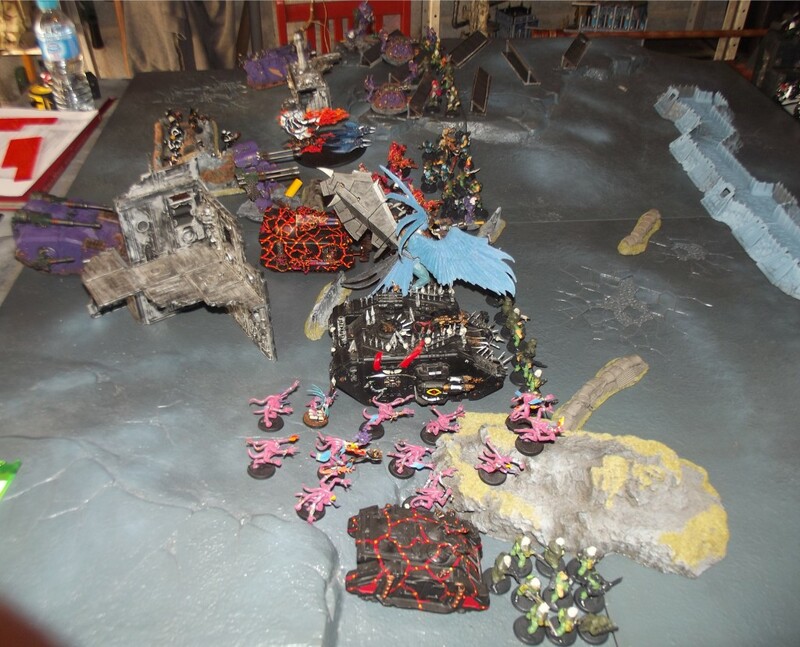 Fire and blasts rained down as the chaos forces focused their attentions on the conscripts attacking them with fire and psychic blasts feeding the blood storm as they killed. The last few cultists were herded into the dark angels to aid the ritual throwing themselves at the space marines. 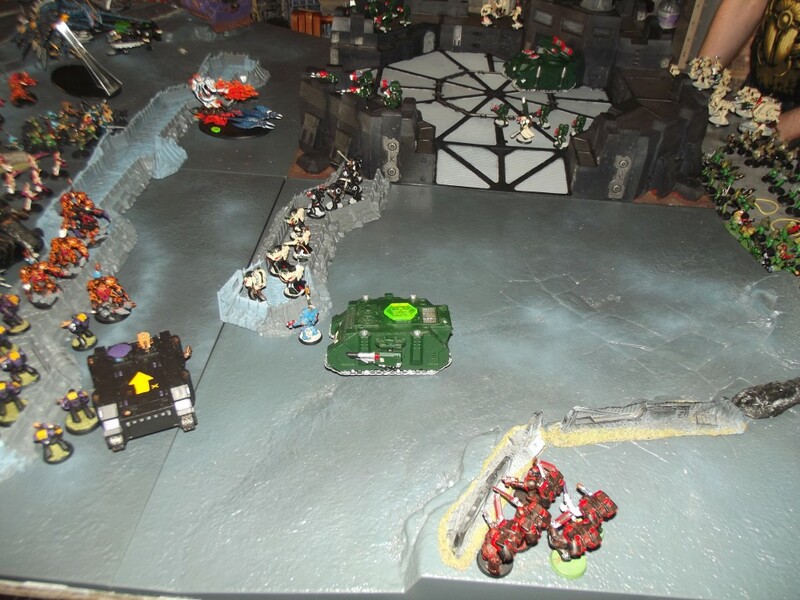 The dark angels knowing of the storms effects did not fire at the charging mob but were forced to defend themselves in close combat, downing a handful of cultists. Suddenly the storm lifted and the sky turned blood-red. Rain began to fall coating the very ground with red droplets of blood. The dark angels knew that the ritual had been completed and that chaos reinforcements would not be far behind not the obstruction of the storm had been removed. Teleport flashes could be seen as the deathwing terminators departed with their catch. 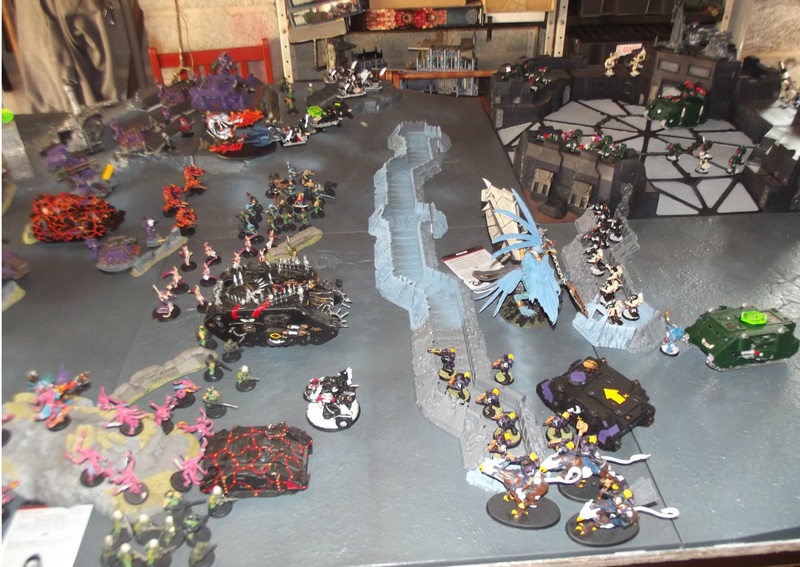 The remaining imperial forces along with the storm hawks’ rhino Infamy, pulled back as the chaos forces paused to bask in the falling rain of blood. Being pressed for time we concentrated our efforts on the stronghold during turn 5 and ignored all of the other combats and actions being conducted elsewhere during the chaos turn, due to having hit the 101 or more infantry killed quota. The focus was then on the conscripts and cultists which directed us to fight it out on the stronghold itself as this was the key to victory/loss in this mission. Back to the game in question the dark angels did really well, being able to weather the storm of shooting and counter attack successfully. The Stronghold did its job very well protecting the conscripts until T3. 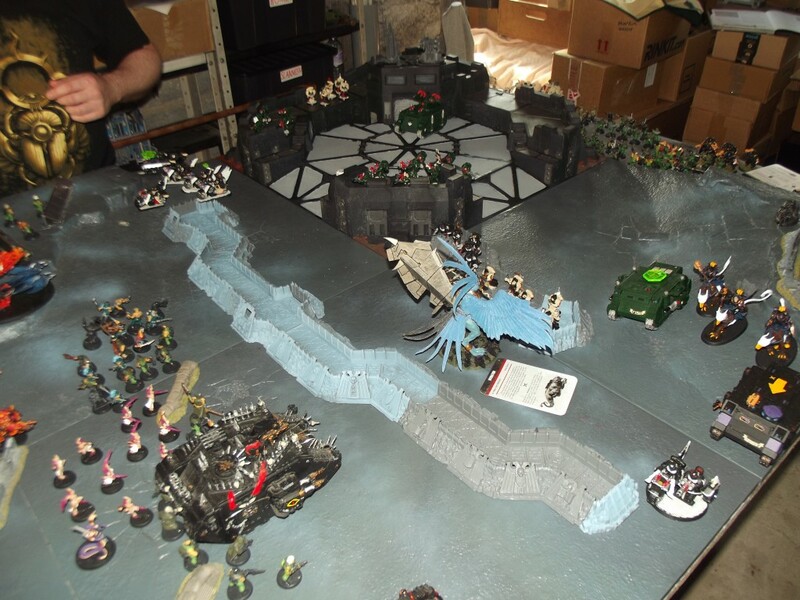 As for the Dark angels, they were made available when we never had a visit from the fallen throughout the games we have played so far but their intervention was not enough to save the day this time. Looking back on the game the scattered landings of the Deathwing ultimately left the stronghold undermanned but in true Dark angels fashion they ignored the objectives of their allies and acquired a member of the fallen. 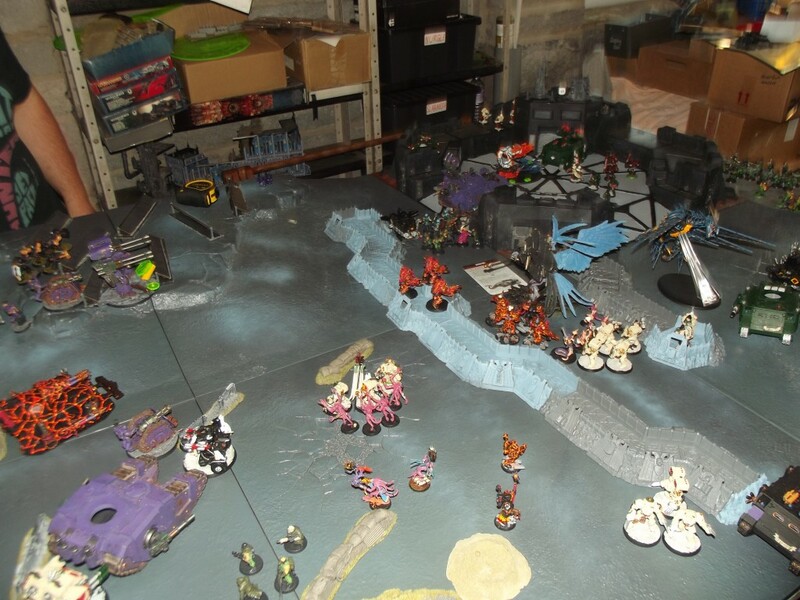 This will allow the imperial side to identify one of the chaos apocalypse stratagems. 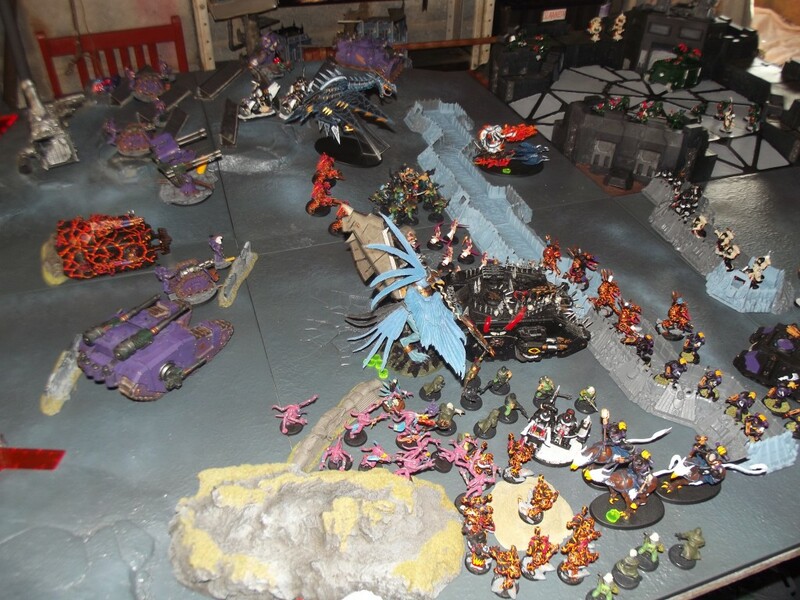 Overall so far throughout the campaign 1,376 models have been killed during our games (783 Imperial and 593 Chaos.) On average across the fifteen games we have played so far [Including the initial smaller missions] is 92 dead models per game. With the imperium on average losing 4 models for every 3 chaos models they have managed to kill. Showing just how close the games have been so far. We now move onto the attack on Altum itself. The Apocalypse beckons and we shall answer the call. You’ve kept a running body count for the campaign? That’s impressive! That’s an awesome idea, a memorial. You guys throw down some big stuff. Be interesting to see the report. Breaking it into parts would probably be a good idea. How big of a game?